Ken Ham hosted Bill Nye on February 4, 2014 at the Creation Museum for a debate over the thesis: “Is creation a viable model of origins in today’s modern scientific era?” The origins of this debate, however, began with Bill Nye’s YouTube video: Creationism is not Appropriate for Children, in which he condemned the teaching of the biblical account of creation. Al Mohler posted a deft assessment of the debate here. The debate was more equal-time presentations with a little interaction. I was hoping for more interaction, but I am thankful that faithful, biblical truth was presented well and respectfully. In response to Bill Nye’s original video, the Sovereign Grace Baptist Church of Northport, AL asked a few pastors to respond to the video for a page on their website. You can find that original page here: here. I have included my response to the video below. Bill Nye’s major premise in this clip is, “Evolution is the fundamental idea in all of life science, in all of biology.” In his estimation, evolution is what enables people to live consistently “with everything we observe in the universe,” and without it you cannot do science, “You’re just not going to get the right answer.” He also deems evolution necessary for a stable developing society with “scientifically literate voters and taxpayers . . . engineers that can build stuff, solve problems.” From this, Bill Nye draws a moral imperative that children should not be taught the biblical account of creation, but rather they should be taught evolution as truth and fact. Nye refers to the “intellectual capital” we have today and believes evolution is necessary for building that capital in the future. This is historically untenable. The capital we have today was contributed to significantly by professing Christians, believers in the Bible. If evolution is the only way to get the right answer, how can we account for the work of Francis Bacon, William of Ockham, Nicolaus Copernicus, Johannes Kepler, Galileo Galilei, Blaise Pascal, Robert Boyle, Gottfried Leibniz, George Boole, or Michael Faraday to name a few? Did these men and others like them get the right answer? When anyone does empirical science across all the branches, biology included, it is not on the basis of evolution. Why do we not treat cancer with honey-roasted cashews? Why not? If we are doing science on the basis of random processes, matter in motion, unobserved and unrepeatable events, then cashews, malted milk balls, and chemotherapy are all just as likely to “work,” or not. We don’t do science on the basis of evolution, but rather on the basis of order, cause and effect, and uniformity. We use observation, experimentation, and reason while presupposing the order and uniformity of natural laws, which are a part of the Christian worldview. No part of the empirical process is dependent on a theory of origins that is itself ever evolving. Further, why should we treat cancer at all? In a materialist universe, evolution does not care and offers no basis for the judgment: it is good to save life. In a Christian worldview, we have the basis for development of treatments and the moral imperative to do so. Random processes and matter in motion just do not care and do not provide any reason for anyone to care. I am not impugning his character nor questioning his motives. 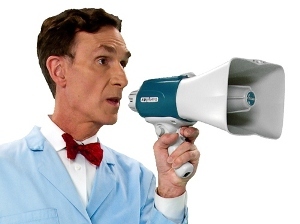 I believe Bill Nye wants to see the advancement of science, engineering, and technology and that he wants this for the good of the human race. But if evolution is the fundamental idea by which he lives life in consistency with the universe, he has no foundation to care about any of this nor what parents teach their children. Evolution does not care. If there is no design or motive, then it simply does not matter what happens.